When Journalism Fails: When Breaking News Happens - Minimize It! When Breaking News Happens - Minimize It! That seems to be the philosophy of the Cincinnati Enquirer. Here's the home page this Sunday afternoon. 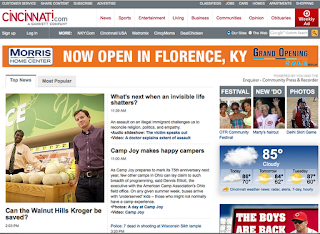 The headlines: What's next when an invisible life shatters; Camp Joy makes happy campers; Can the Walnut Hills Kroger be saved. And just above the fold in little bitty type: Police: 7 dead in shooting at Wisconsin Sikh temple. The Enquirer certainly has an interesting strategy, and it will be interesting to see if being as dull as possible on the Sunday home page increases page views.